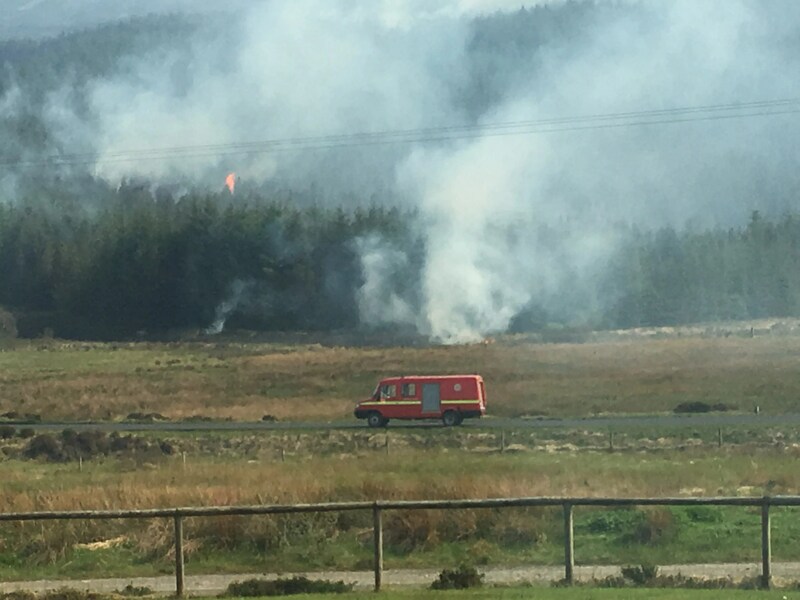 One of the perils of dry weather in the Highlands is the almost constant threat of wildfires. Some start naturally, a tiny dewdrop acts as a magnifying glass intensifying heat onto a small area of grass or other vegetation and it can catch fire spontaneously. However others are started either by carelessness or pure stupidity. May 27th 2018 will be forever etched in the memories of a great many people not least, those of us that live here in the small settlement of Crossal, Glen Drynoch. A wildfire that started off as a small fire to burn paper by a camper located in the wrong place, turned nasty within minutes. 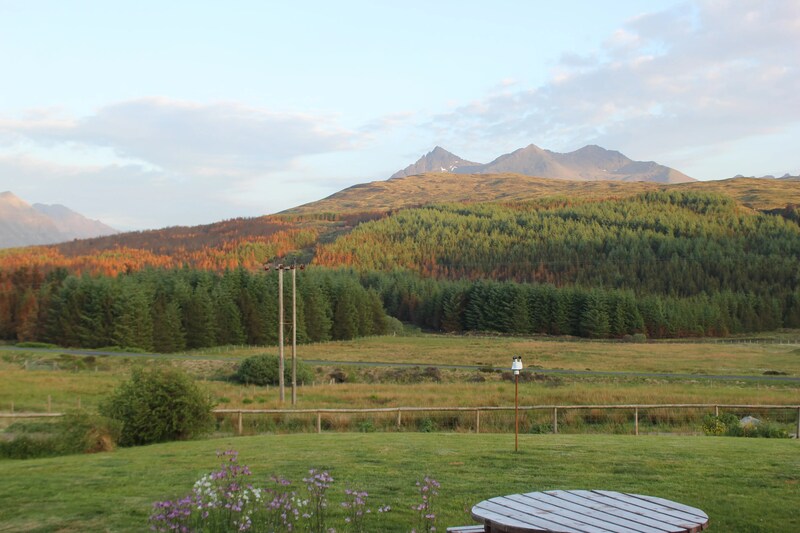 It had been dry on Skye for several days, the sun had been hot, so everything was tinder dry. Before long the fire was WILD! Leaping towards the foothills of the Black Cuillin, fanned by a North Easterly breeze, it grazed the edge of the forest on the south side of the glen. 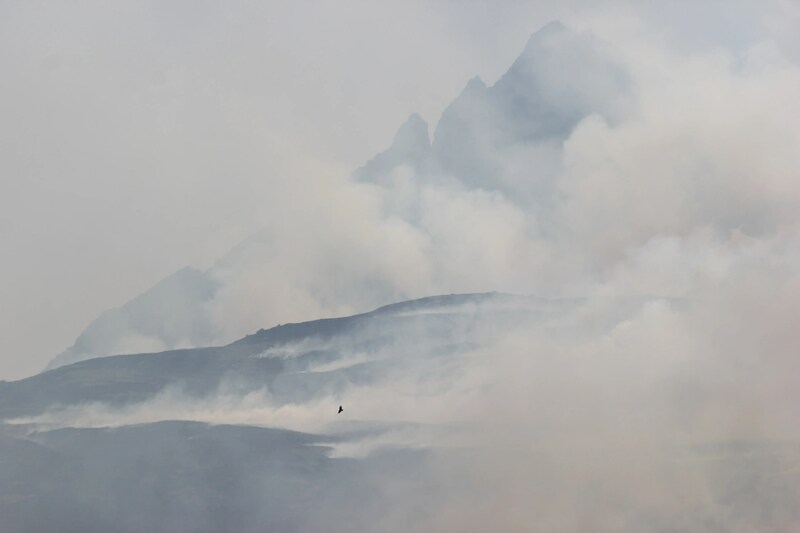 By lunchtime as the smoke cleared it was evident that the entire hill behind the forest had been burned. Where would it go now? 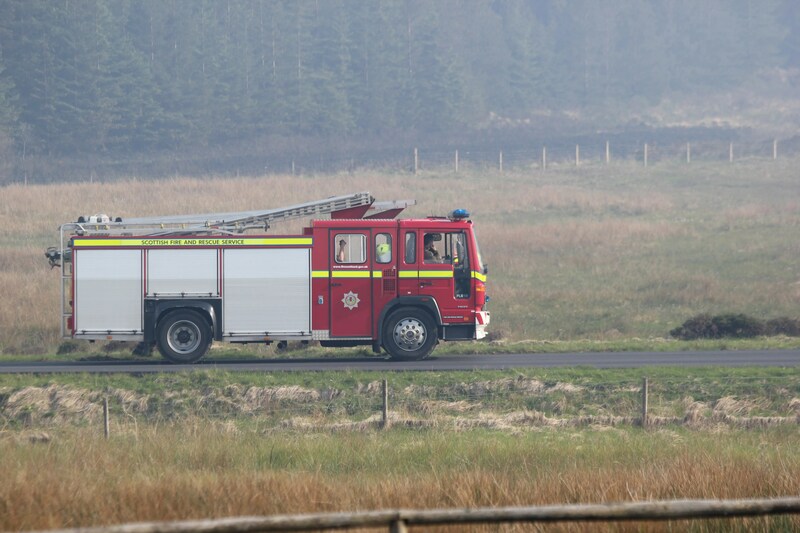 Scottish Fire and Rescue Service was here in force – 6 tenders in total – trying hard to control a fire that was fast racing away into the hills. Suddenly the wind stopped – would it die down now? 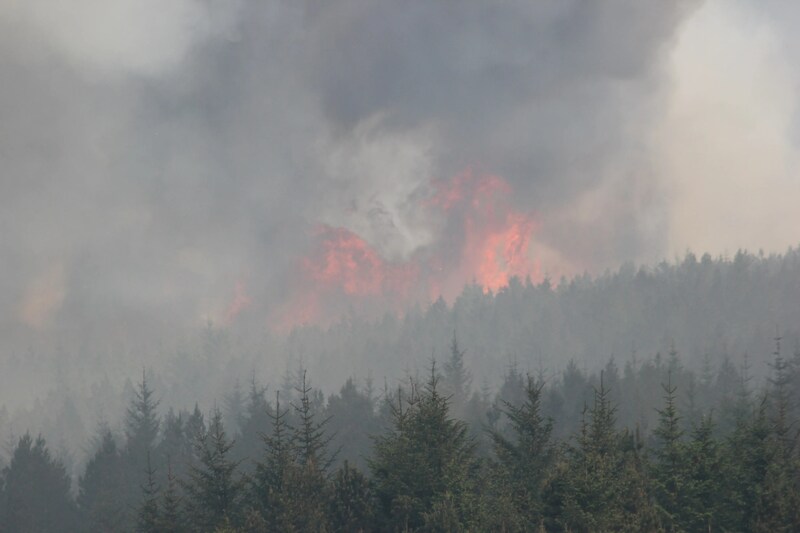 But just as suddenly the wind did a full 180 degs turn and began fanning the flames into the top of the forest. 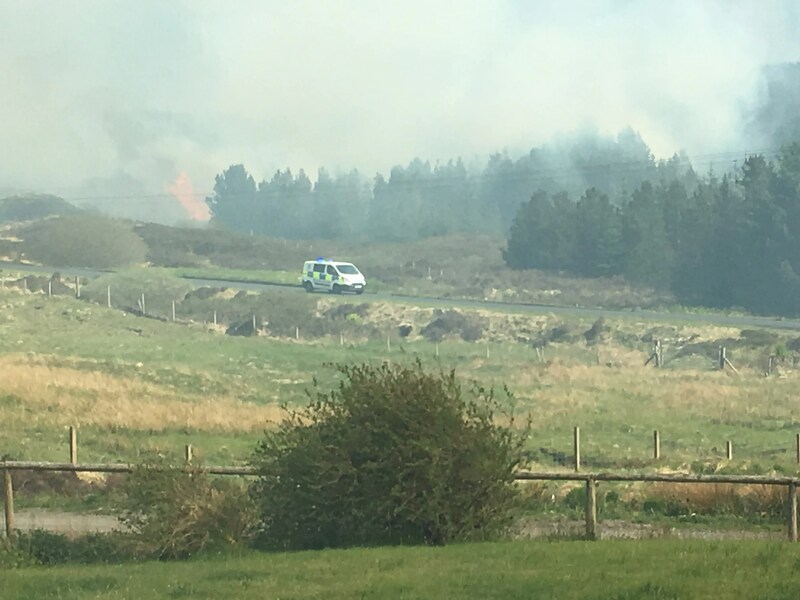 By 14:30 huge towering flames could be seen in the south east of the forest, and before long it poured over the hill and down, burning trees as it went – huge billows of black smoke and great towering flames. 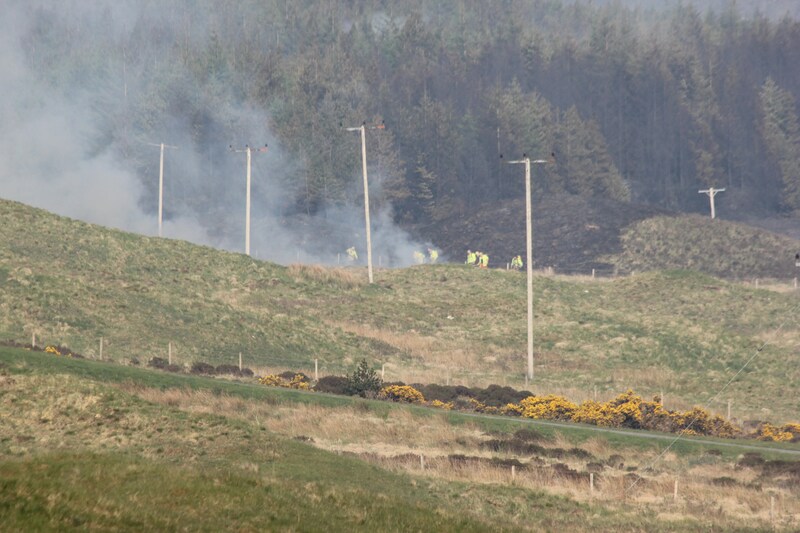 That part of the fire was out of reach of the fire service yet fast racing down the hill toward Crossal. 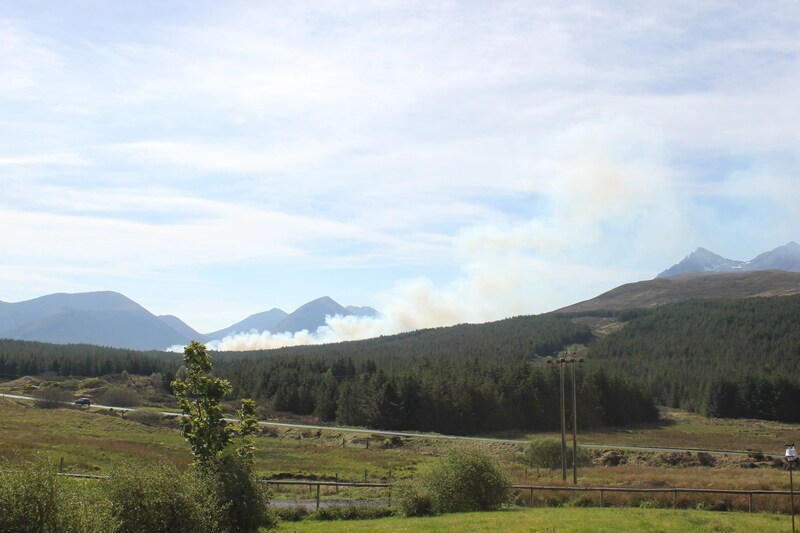 As each copse went up in flames the fire divided like forks following the lines of least resistance, following the burns and the dry under storey, then appearing further down the forest in a completely new area, closer and closer into the bowl of the glen. It was one of the most shocking sights I have ever seen, certainly the most terrifying. 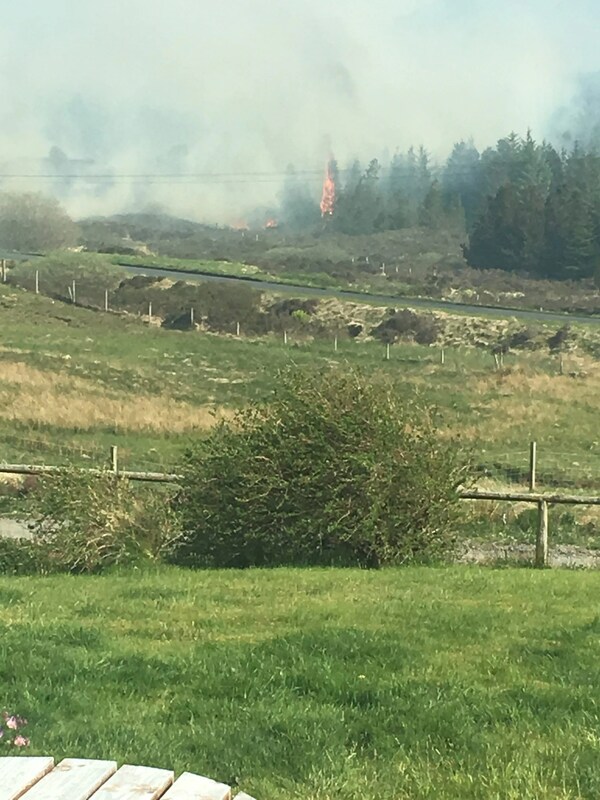 Fire Fighters methodically tackled the fires that came close to the road and extinguished those on the far side of the River Drynoch, thus stopping it from crossing the river and setting light to the meadow across from the houses that was full of grazing sheep and cows. Yet still it came too close for comfort. 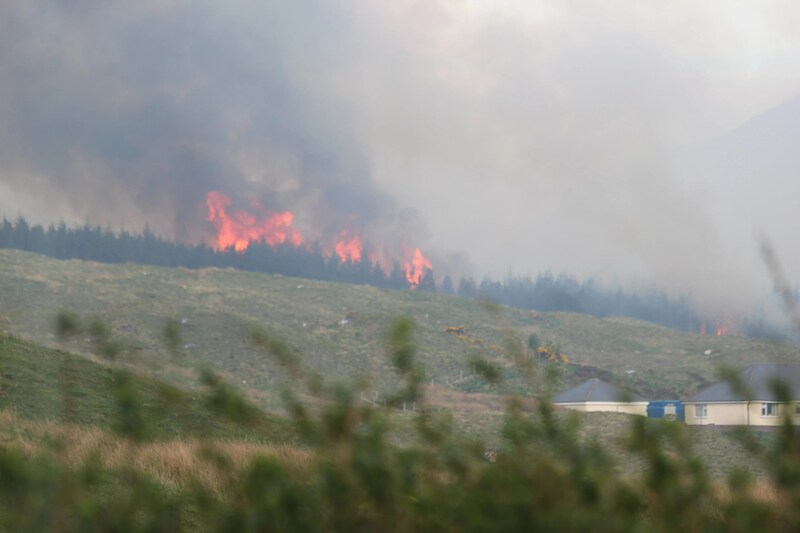 There were new trails of fire everywhere and at one point the flames did manage to cross the road, right opposite the forest to the east of Crossal. How it missed the power lines is still a mystery today, but it raced up the west side of that forest with Fire Fighters beating it out to prevent it from spreading into the meadows that surround the houses. But still the wildfire made serious inroads into that forest, with flames higher and more terrifying than I have ever seen as trees were literally gobbled up by the fire. You could hear the roar as each tree succumbed. How the Fire fighters coped, not just with the intense heat of the fire but also the intense heat of the day – as they had to wear full protective gear -simply leaves me with so much respect for these volunteers who worked tirelessly all day and most of the evening to extinguish the fire. 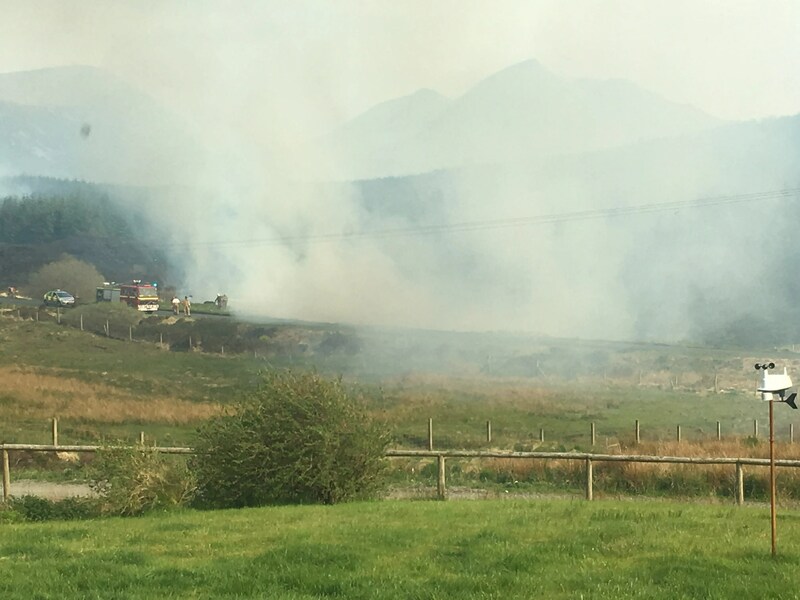 As the fire near us was brought under control, fires in the glens closer to the Cuillin were still raging and in fact wildfires were still burning the following day until the wind changed direction again and they burned themselves out. 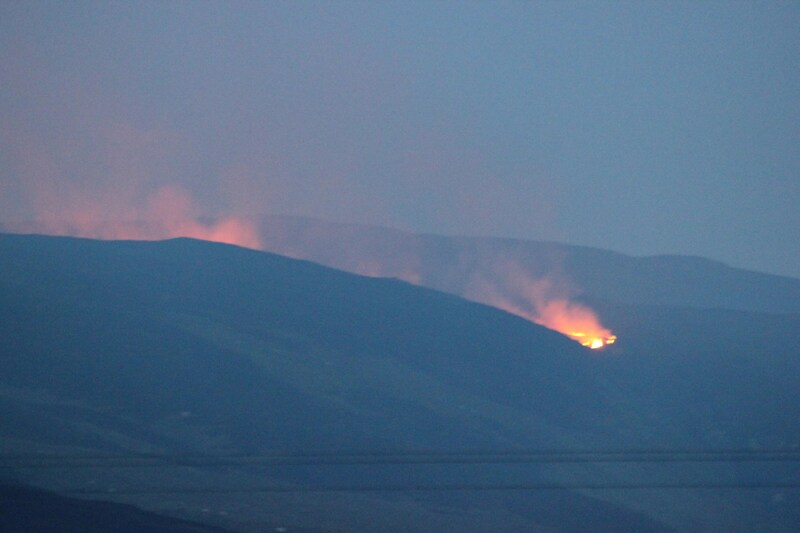 We watched the flames late that night as they tumbled over the hill towards Drynoch falls. It was spectacular in the dark of the night but terrifying at the same time… would it continue down the falls following the scrub and bushes or would it die and burn itself out? Thankfully it did the latter. Today these forests are dying! Great swathes are burned black as you’d expect, but trees that immediately after the fire appeared untouched, are dying. Turning copper, daily as their roots fail them. Either because they were damaged during the fire or because the fire is still travelling beneath the ground in the peat. Smouldering away until it gets a little oxygen then flares up again – sending smoke billowing into the sky (there have been several flare-ups over the past 10 days that the Fire Service has been called to attend). And what of the wildlife that suffered as a result of this carelessness, this abject stupidity? The Buzzards lost their young, they would have been almost ready to fledge. The adult birds called and called throughout the day of the fire, circling constantly, clearly distraught and for days afterwards they called and circled. They are gone now! Countless finches that nest in the copses in that forest have lost their young. The Cuckoo – a bird that, whilst plentiful here on Skye, is endangered elsewhere, would also have lost young. I can hear them each day with their distinctive call searching for their mate so they can start again. Whilst its early enough in the season for most of these birds to start again, the loss of wildlife and habitat is criminal! Over time I will post follow ups of this blog so all can see not only the progression of the devastation to the forest itself, but also the regeneration of the land – the under storey mostly, which will change the way it is used and also the types of wildlife that will inhabit it. Thank you for your detailed account, it is absolutely devastating to read. The poor animals and birds losing their young, hopefully they will be able to regenerate. I didn’t realise that this fire came so close to property, so glad that you are all safe. It is alarming tho think what one stupid action did it beggars belief. Deeply sad Tania. On March 25th we left your B&B after 3 wonderful nights and on March 27th a stupid careless person set the forrest on fire. I’ve read about the fire on line but your description is much more clear to me. Thankful that you and others nearby are safe but very upset about the animals, baby birds and that beautiful forrest in front of your home. We are thinking of you and your two great dogs!